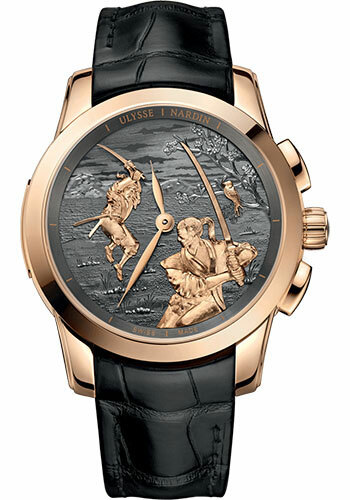 43 mm 18K rose gold case, sapphire crystal, anthracite grey dial with hand-carved figures, Caliber UN-610 self-winding movement with hourstriker, leather strap, folding buckle. Water resistant to 30m. 43 mm platinum case, sapphire crystal, anthracite grey dial with hand-carved figures, Caliber UN-610 self-winding movement with hourstriker, leather strap, folding buckle. Water resistant to 30m. 43mm platinum case, sapphire crystal, genuine black enamel dial, Caliber UN-610 Self-winding movement with hourstriker., leather strap, folding buckle. Water resistant to 30m.